Recipes to fill your belly. This is a very simple, no recipe needed meal. The steaks were seasoned with a little salt and a lot of black pepper, then cooked in the skillet. 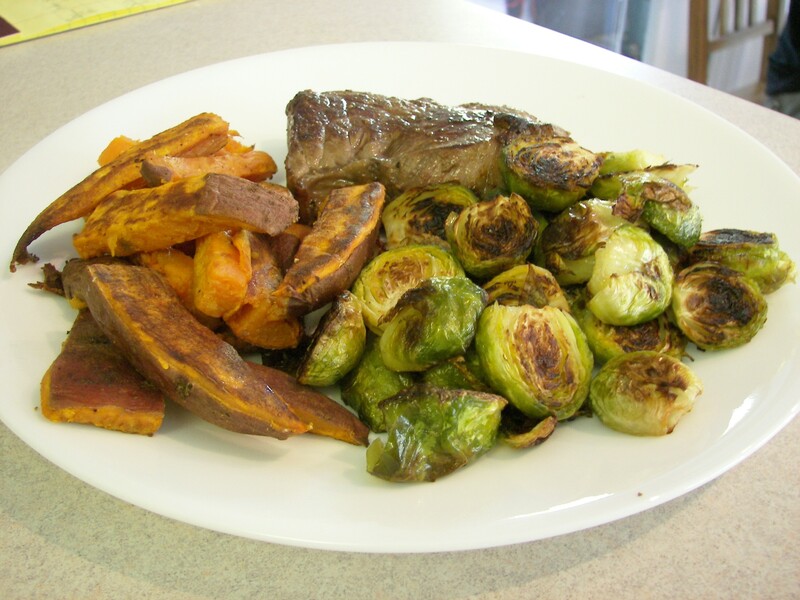 The Roasted Sweet Potatoes and Brussel’s Sprouts were roasted with olive oil, salt and pepper in a 400 degree oven. Very simple. I love it! This was a quick and yummy recipe. The recipe is in Cooking Light, but it is actually an Ellie Krieger recipe. Sprinkle pork with salt and pepper. Heat a skillet over medium high heat and cook pork about 5 minutes on each side (depending on thickness) until cooked through (145F). Remove from pan, keep warm. In the same skillet add the butter and shallots, saute about 3 minutes, add the broth, boil, add mustard and maple syrup, cook about 1 minute until slightly thick, add pork chops back to pan for about a minute (don’t over cook!). Serve the pork topped with the yummy sauce. 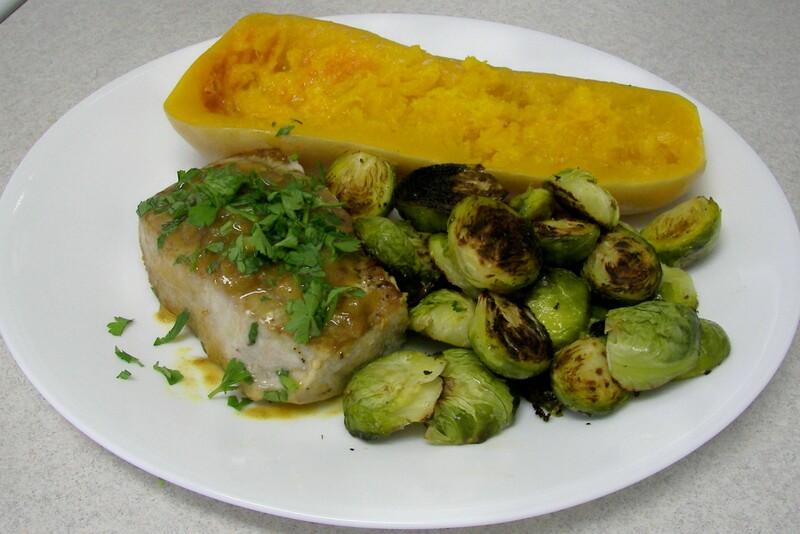 I served this with Roasted Brussels Sprouts and Baked Butternut Squash, yum! This was a no-recipe night. 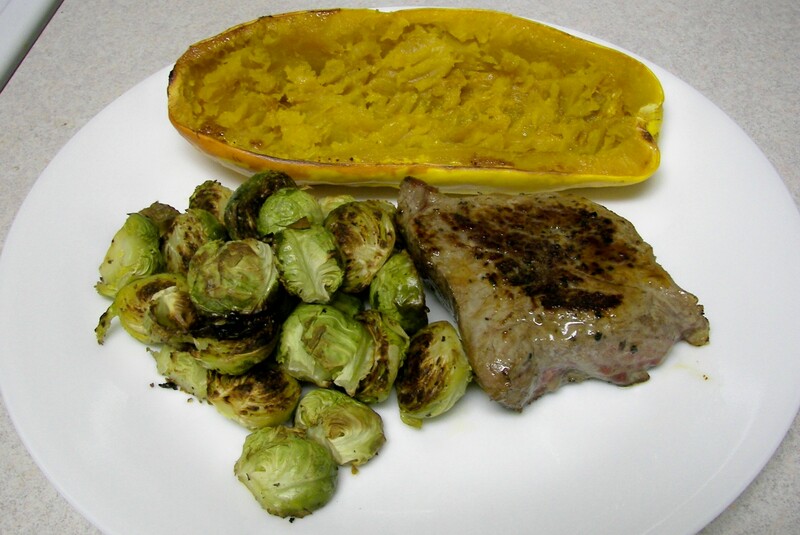 The steak, squash and Brussel’s Sprouts were all lightly seasoned so that their natural flavors would shine. This is one of my favorite meals. Generously season the steaks on both sides with salt and pepper. Heat some olive oil in a medium sized skillet over medium high heat. Once the skillet is hot add the steaks, cook about 5 minutes on each side. The steaks will become firmer as they are cooked longer, this is how I tell when they are done. I typically like mine medium-rare, while my husband likes his medium-well. Heat the oven to 400F. Cut the Delicata in half and scoop out the seeds. Place face down in a large baking dish, add about 1/4 cup of water, bake until tender. Tops may begin to brown some. When tender turn over and add about 1 tsp butter to each half. 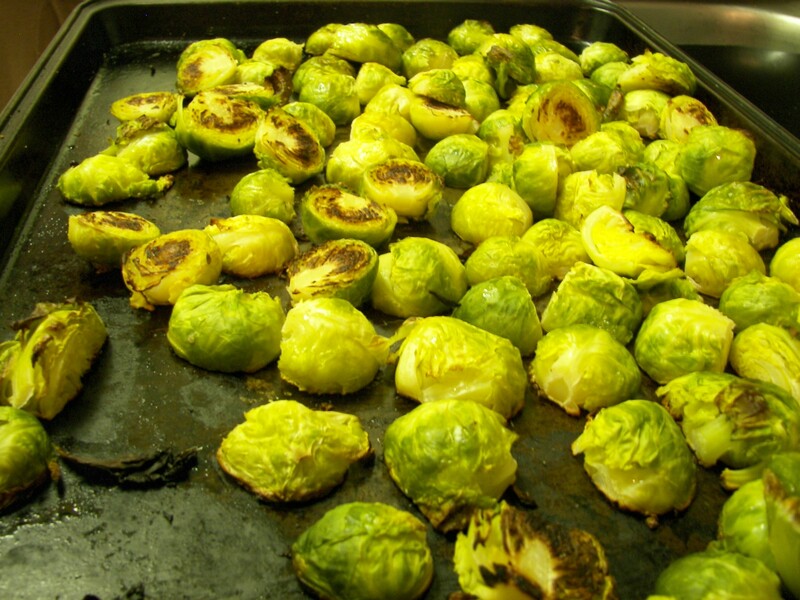 Cut the Brussel’s Sprouts in half and place face down in a large baking pan that has been coated with about 2 Tbsp olive oil. Sprinkle salt and pepper over BS and add about 2 Tbsp water or veggie broth to the pan. Roast until very browned. This will bring out the natural sugars and caramalize them. Yum! This was a great meal! I started brining the turkey a few years ago, and will never go back. The turkey always turns out juicy. It’s wonderful, definitely worth the extra effort. The recipe I use is from Martha Stewart. The turkey needs to soak in the brine for about 24 hours, so plan accordingly. You will also need to make room for a large container in your fridge. I use a 5-gallon bucket lined with a brining bag. This recipe makes enough brine for one 18- to 20-pound turkey. Bring 1 quart water, the salt, bay leaves, and spices to a simmer, stirring until salt has dissolved. Let cool for 5 minutes. Line a 5-gallon container with a large brining or oven-roasting bag. Place turkey in bag. Add salt mixture, remaining 6 quarts (24 cups) water, and the other ingredients. Tie bag; if turkey is not submerged, weight it with a plate. Refrigerate for 24 hours, flipping turkey once. Heat oil in a stockpot on high. Add turkey parts, and cook until browned, about 8 minutes. Add remaining ingredients. Bring to a boil. Reduce heat; cover partially. Simmer gently, skimming foam from surface as needed, for two hours. Pour stock through a fine-mesh sieve into a bowl, discarding solids. Stock can be stored in an airtight container in the refrigerator for up to 5 days or in the freezer for up to 3 months. Remove turkey from brine. Discard brine (remember this has raw turkey juice in it, think food safety). Pat turkey dry inside and out with paper towels. Place, breast side up, on a rack set in a roasting pan. Let stand at room temperature for up to 1 hour. Preheat oven to 375 degrees, with rack in lowest position. Tuck wings underneath the turkey, and tie legs together with kitchen twine. Brush turkey all over with butter, and season generously with pepper. Roast turkey, basting with pan juices every 30 minutes and rotating the pan after 2 hours, until a thermometer inserted into the thickest portion of the thigh registers 165 degrees, 2 1/2 to 3 hours. Transfer turkey to a platter, reserving pan juices for gravy. Let turkey stand for 30 minutes before carving. Pour pan juices into a glass measuring cup or a gravy separator, and let stand until separated, 10 minutes. Pour off fat. Add wine or stock to the roasting pan and scrape off anything left on the pan. Pour this into a medium size pot, add the reserved juices and stock, and bring to a simmer. Meanwhile, whisk together remaining 1/2 cup stock and the flour in a bowl until smooth. Whisking constantly, slowly add flour mixture to the pan. Simmer until gravy is reduced by half and coats the back of a spoon, 10 to 12 minutes. 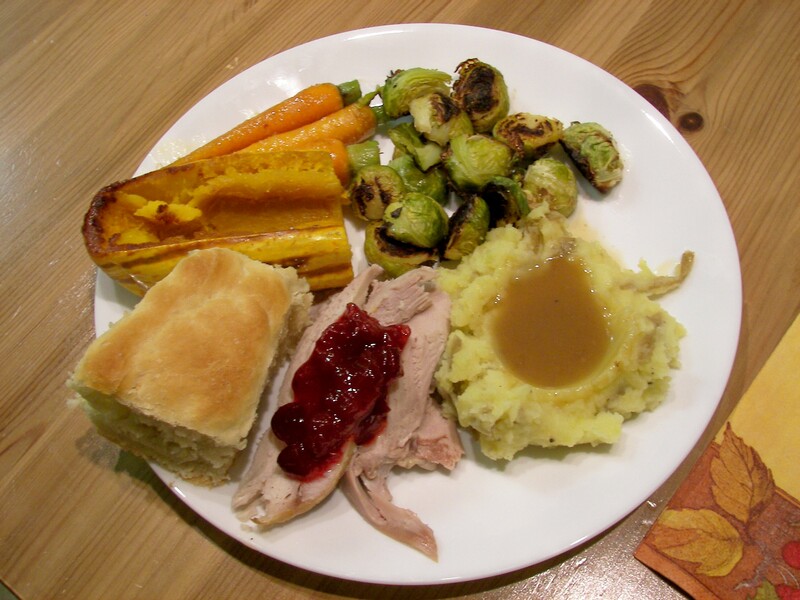 This is my favorite cranberry sauce, simple but with hints of ginger and orange. This is from Cooking Light November 2008. Combine first 6 ingredients in a medium saucepan; bring to a boil over medium-high heat. Reduce heat to medium; cook 12 minutes or until cranberries pop. Remove from heat; stir in rind. Cool completely. Serve chilled or at room temperature. These are called Grandmas Rolls because this is the recipe my grandma always made on Thanksgiving and Christmas. The best rolls! Pour warm water into large bowl. Sprinkle yeast over water, add sugar and salt. Stir to dissolve. Add egg, butter, and 3 cups flour. Beat very hard for 2 minutes. Add 1 cup flour beat hard. Add last 2 cups by hand, knead until smooth and elastic. Brush top of dough with melted butter. Cover and let rise in fridge for 2 hours or until double. Punch down. Can make ahead and punch down once per day up to 3 days. Butter your baking pans and roll the dough into small balls, place in baking sheet. When all the dough is gone (typically I will fill a 13 x9 pan and a 8 x 6 pan). Bake at 350-375 for 10-15 min until golden brown. Trim stems of carrots to 1/2 inch. Scrub carrots well. Melt butter in a large skillet over medium-high heat. Add ginger, and saute, stirring, until transparent, about 2 minutes. 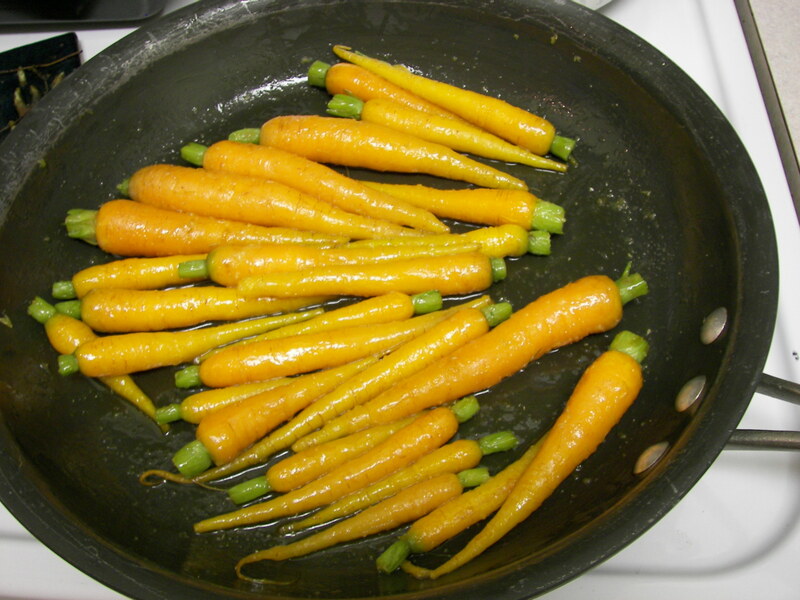 Add carrots and honey, and cook for 4 to 5 minutes, or until carrots are glazed. Serve immediately. If you think you don’t like brussels sprouts, try them this way. Oil a large baking sheet (olive or canola). Cut each brussels sprout in half and remove the outer leaves. Place each one face down on the sheet. Sprinkle with salt and pepper and pour 1-2 Tbsp water or stock over the top. Place in the oven for 10 minutes. Stir or shake them around and continue to roast until they are very well browned. I also made mashed potatoes, and baked winter squash. Both are very simple. Simple mashed potatoes are my favorite (butter, milk, salt, pepper. yum). The baked squash only had a little salt on it. To prepare crust, place ginger snaps in a food processor; pulse 2 to 3 times or until finely ground. Add butter; pulse 10 times or until mixture resembles coarse meal. Firmly press mixture into bottom of a 9-inch springform pan coated with cooking spray. Bake at 400° for 10 minutes; cool on a wire rack. To prepare filling, beat cheese with a mixer at high speed until smooth. Add the granulated sugar and next 8 ingredients (granulated sugar through vanilla), beating well. Add eggs, 1 at a time, beating well after each addition. Add pumpkin; beat well. Pour cheese mixture into prepared crust; bake at 325° for 1 1/2 hours or until almost set. 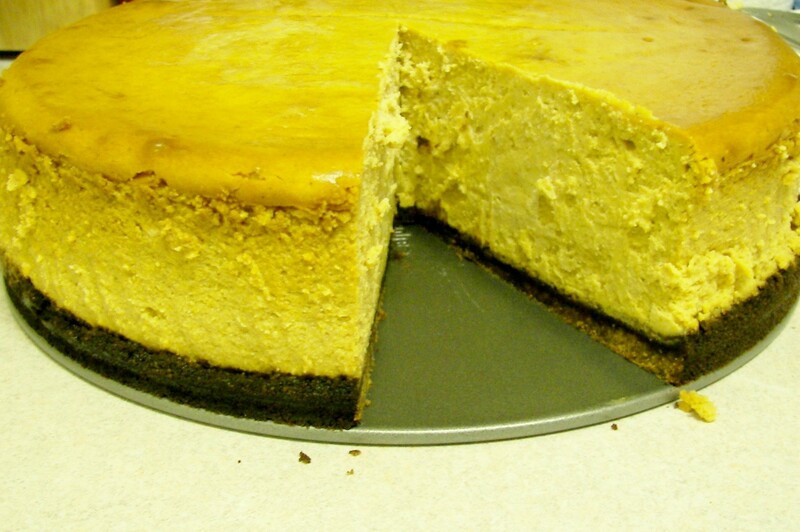 (Cheesecake is done when the center barely moves when pan is touched.) Remove cheesecake from oven; run a knife around outside edge. Cool to room temperature; cover and chill at least 8 hours.